The doctor or dentist’s offices can be frightening to young children. The hospital environment can intimidate adults as well, so waiting rooms that offer a soothing first impression, especially for children, go a long way toward effective treatment. 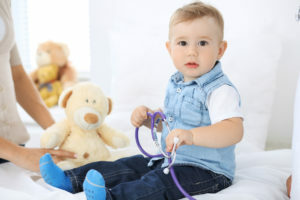 Pediatric offices have recently begun to see the positive, treatment benefits of providing child-friendly office esthetics that offer sensitivity and present a non-threatening environment. 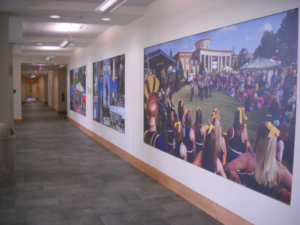 For Atlanta pediatric offices, wall graphics from Apex Signs and Graphics can play a large part in creating a soothing and playful environment that easily incorporates with the needs for an easy cleaning as well as welcoming, child-friendly entryway. When considering a creative theme for a pediatric office, designs that inspire creativity and capture children’s curiosity work best to distract them from the pending treatment. Consider bright colors and playful characters that instill a sense of charm and can help children focus on their surroundings rather than any impending fear they may feel. While bright colors and playful characters are a great part of welcoming many children some pediatric offices, such as those offering counseling services, may require more of a calmer atmosphere for waiting rooms. Wall graphics designs for these type surroundings can still play a significant part in making children feel comfortable. Choosing themes such as the ocean floor or the forest at night, can be coupled with calming paint colors, furnishings and soothing music to create a peaceful environment. Whether your need is for colorful wall graphics for your pediatric dentist office or a stand out lobby sign to welcome young patients in a happy way, Apex Signs and Graphics are experts finding the perfect design. 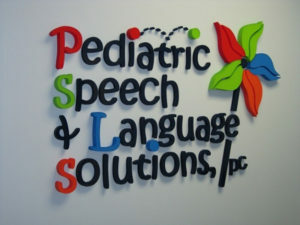 Apex Signs & Graphics will help you design and install unique wall graphics that will create an atmosphere of relaxation, comfort, and welcoming for your young patients. Ready to create the perfect ocean room or zoo waiting room? Contact Us or Call (678) 795-0775 now!